Today is Day One of our sew-a-long, and we are measuring and cutting. Join our sew-a-long group here on Facebook. Make sure to grab your Mama Bridgette and Mama Victoria patterns. We also have a bundle of the patterns if you want both. 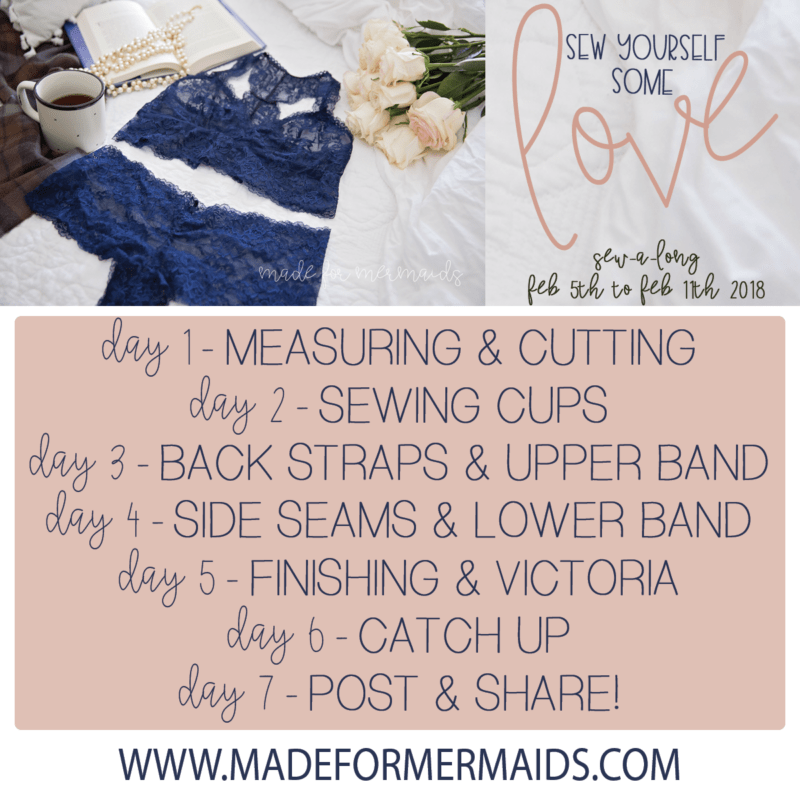 We have a Lounge & Lace FAQS post here with LOTS of information. After measuring and choosing your size, it’s time to cut your pieces. There is a video linked in the tutorial on cutting your pieces. It is on page 7 and says ‘SEE YOUTUBE VIDEO ON CUTTING HERE!” in blue text. 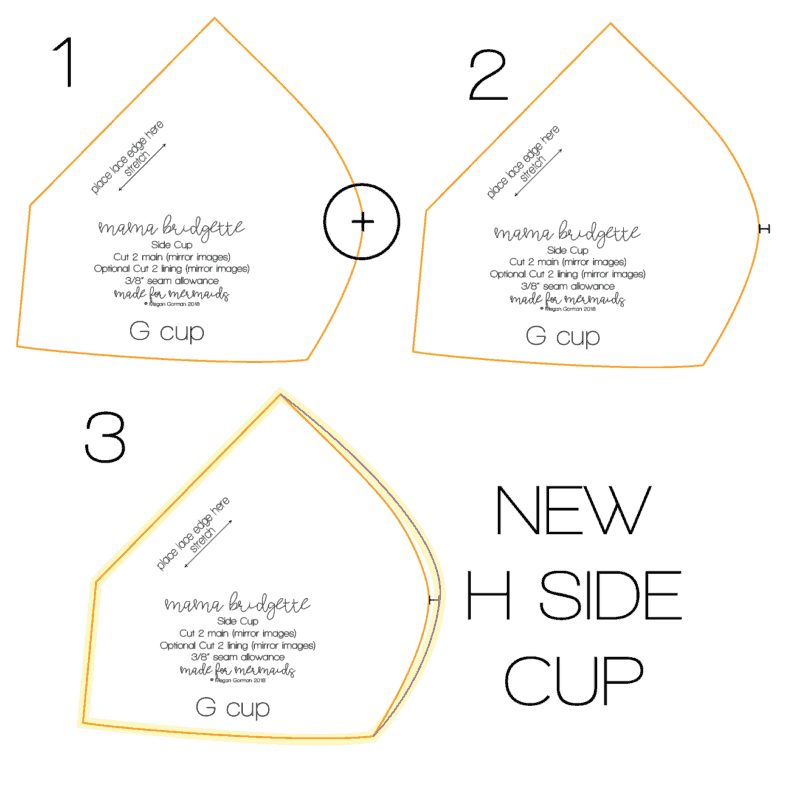 I have seen a few ladies asking how to grade up one cup size for the Bridgette. 1- For the side cup, first find the widest point on the piece (circled and marked with an ‘x’ below). 2- Then mark 1/4″ from that spot. 1/4″ would be 1 cup size, 1/2″ would be 2 cup sizes and so on. 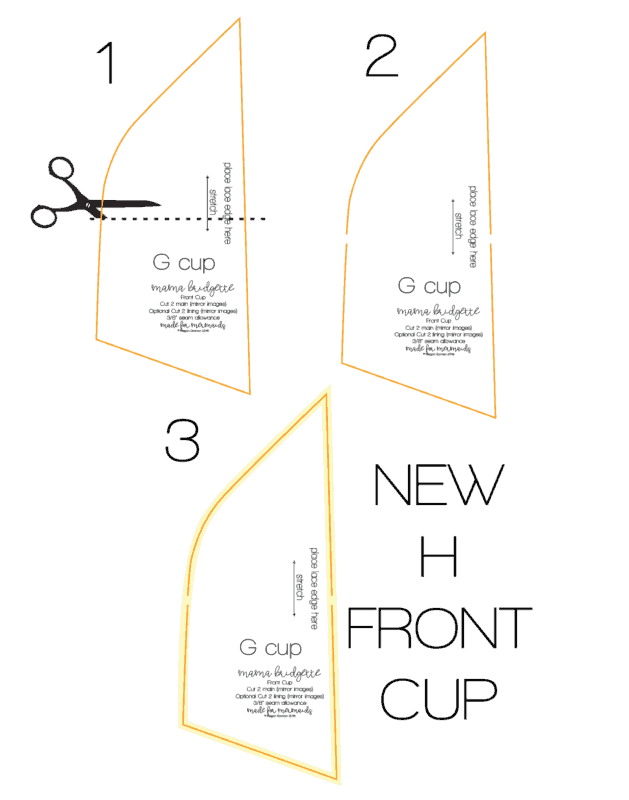 3- Use a french curve to redraw cup piece. 1- Find the widest point on the cup and slash the piece. 2- Spread the piece by 1/4″ and redraw piece. Again, 1/4″ would be 1 cup size, 1/2″ would be 2 cup sizes, and so on. You want to slash and spread the same amount you added to the side cup or your pieces will not ease in and fit together correctly. 3- Redraw piece for new front cup. However, if you’re using a different knit and don’t want the center seam, it’s very simple to adjust. 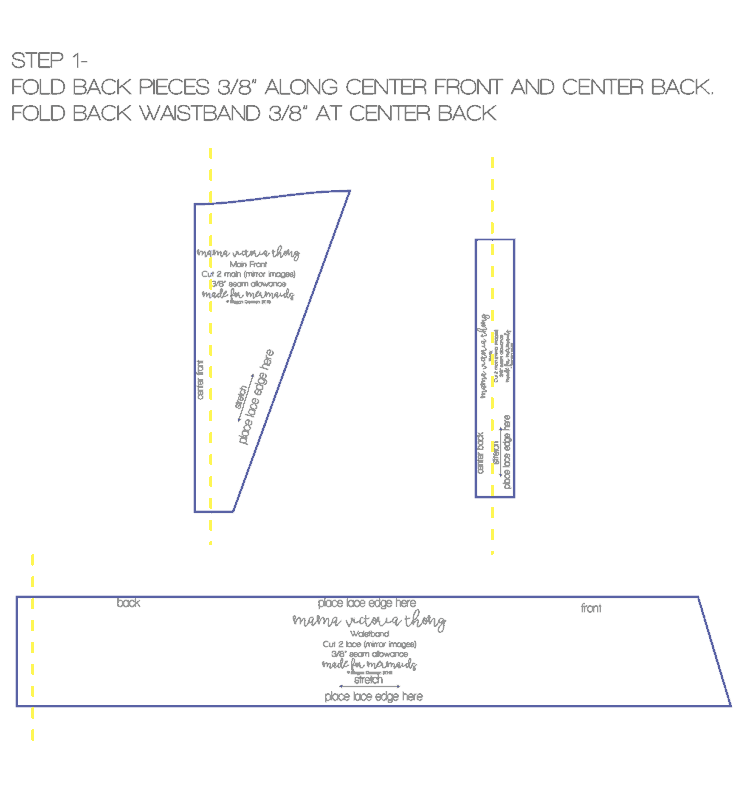 Fold back or cut 3/8″ off the front center and back center pattern pieces. You can also cut the waistband on the fold by folding back or cutting 3/8″ off the back pattern piece. Make sure to post in the Facebook group and show us what fabrics you have chosen!! Can’t wait to see what everyone is sewing up. For the Bridgette, can you also cut the back pieces on the fold if you’re using yardage instead of galloon lace? Or does it have to be four separate pieces sewn together? 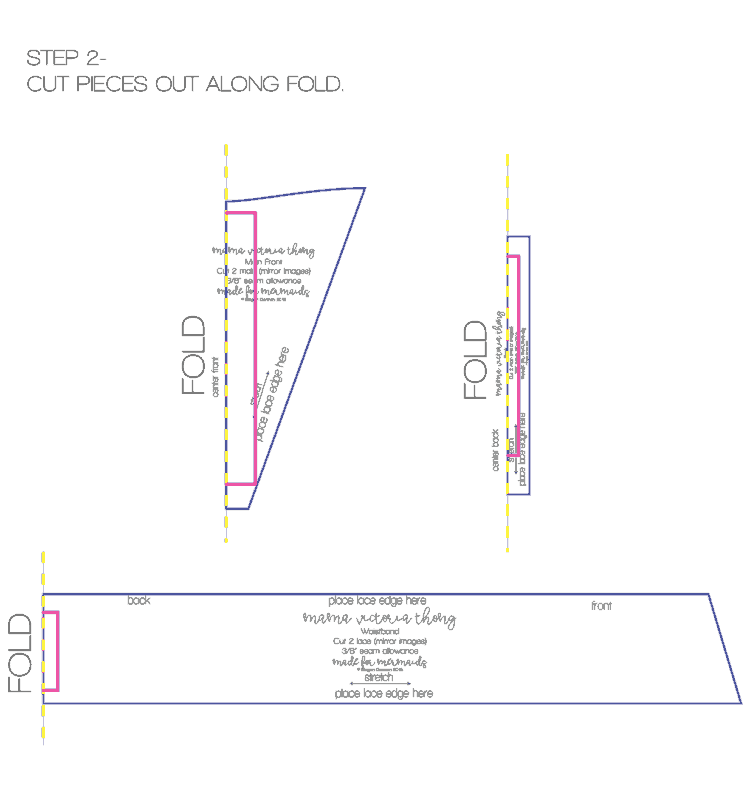 No, you want to cut per pattern so the stretch is going the correct direction! It would be really cool for a fabric shop to make bundles specifically for these patterns.